VATICAN CITY (CNS) — While Christians on earth may be divided into different churches and denominations, in heaven their saints are united and can be powerful intercessors for Christian unity, Cardinal Kurt Koch said during a visit to Russia. The cardinal, president of the Pontifical Council for Promoting Christian Unity, led a delegation to St. Petersburg to return a relic of St. Nicholas to Bari, Italy, after it had been on loan to the Russian Orthodox since late May. 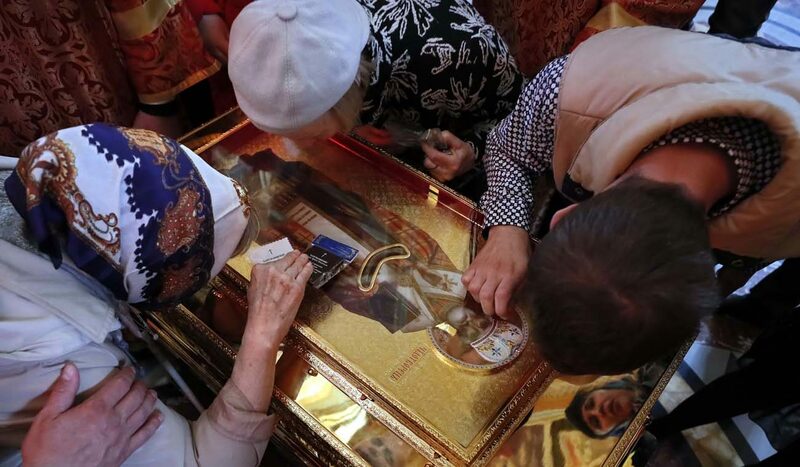 Russian Orthodox officials estimated that some 2 million faithful venerated the relic either at Christ the Savior Cathedral in Moscow, where it was on display until late June, or at Holy Trinity Cathedral in St. Petersburg, where it was on display until July 27. At a Mass July 27 at the Catholic cathedral of St. Catherine in St. Petersburg, Cardinal Koch said Catholics and Orthodox believe that when they venerate a saint, they are giving glory to God. St. Nicholas is one of the patron saints of Russia and, having lived and died centuries before the East-West split of Christianity, he is revered by both Catholics and Orthodox. St. Nicholas was born into a wealthy Greek family late in the third century in a village located on what is now the southern coast of Turkey. After he was orphaned, he dedicated his life to serving God and used his inheritance to help the needy. Nicholas was still young when he was made bishop of Myra. As a bishop, he was renowned for his generosity to the needy, his care for children and his concern for sailors. Persecuted by Roman Emperor Diocletian, Nicholas was exiled and imprisoned. He died Dec. 6, 343, and was buried in Myra. In 1087 when the Turks conquered the region, Christians feared they would not be allowed to visit the tomb, so Italian sailors removed the saint’s relics to the Italian port city of Bari. Cardinal Koch said that while meetings of church leaders are important in the search for Christian unity, the celebration of the saints and veneration of their relics can have an even bigger impact because they involve a much broader group of faithful. The mystical Body of Christ on earth has no denominational boundaries and is just as united on earth as it is in heaven. Our trust is supposed to be in the Head of the Body, which is Christ. Too much attention to relics and saints are a distraction.